Artists across Central Scotland open their doors. 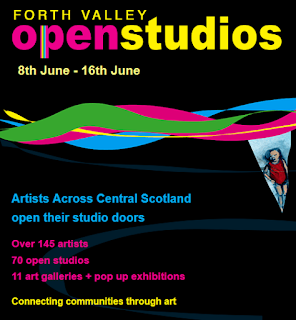 Over 145 artists will be taking part in this year’s Forth Valley Open Studios; a nine-day art event across Central Scotland for artists, designers, makers, art clubs and galleries. Artists open their studios and work spaces inviting all members of the community to view their work. Many offer demonstrations and provide the public with an experience, taking time to engage with the audiences and explain their ideas and inspiration for their work. The studios are organised around 4 coloured routes with numbers and maps. When visiting studios look out for the bunting and signs displaying the FVOS logo. “This is our fourth year and we offer a special welcome to the new artists participating for the first time. You will see that we have introduced a number of innovative features this year. Our website has been updated and re-launched to make it more inter-active. We have launched an app which will we hope make it easier for visitors to find their way around the many different studios and enhance the experience. Also new is a scheme for recent art school graduates to encourage them to participate in this event. As a not-for-profit organisation we are committed to connecting communities through art while at the same time providing a mechanism for artists to sell work and to meet the public many of whom will never have had the opportunity before to visit an artist in his or her own studio. We would like to give a special thanks to all our supporters and advertisers who make this event possible and of course to the artists themselves for all the hard work they do in preparing for the event and ensuring that it runs smoothly- not an easy matter where there are over 80 venues and more than 150 artists! We are extremely grateful for the support from our Honorary Chair Lys Hansen. The Forth Valley Open Studios is registered as a Community Interest Company which is a not for profit organisation. Visitors to studios mentioned in this website and on the app and brochure visit entirely at their own risk. Adults are responsible for the supervision of any children in their care. Those involved in this website, app or brochure cannot accept liability for any loss, damage or injury sustained by any of the public during their visits to the studios. Artists’ studios and makers’ workshops are working environments and may contain hazardous tools, machinery and materials, so care must be taken when visiting them. Whilst every care has been taken in compiling this studio guide, Forth Valley Open Studios cannot be held responsible for any variations, errors or omissions. Info. (2013). About us. Available: http://forthvalleyopenstudios.com/index.php/about/about-us/. Last accessed 5th June 2013.